We, the undersigned, people who have lived and worked in Nicaragua, and others motivated by the recent tragic events, condemn the violent repression of unarmed civilian protesters by the Ortega-Murillo government. This wave of repression began in April 2018 when a large demonstration took place to protest against an increase in social security contributions. Since then, police and paramilitary forces in Nicaragua have killed over 300 people, including students and children, injured 3,000. In the past few days there has been a further clampdown on civil society, and eight different local NGOs have been stripped of their legal personhood, effectively making their work illegal. There are over 400 political prisoners. Many of them are unlawfully detained and are being tortured at the hands of the authorities, accused of crimes of terrorism. The government accuses the protesters of trying to organise a coup. People who support the protests are students, women, workers, employers, civil society organisations and members of the Catholic hierarchy. Doctors who give medical aid to injured protesters have been fired en masse. Teachers, journalists, farmers and environmental campaigners have all suffered at the hands of the paramilitary forces and the police. All of these groups use peaceful methods to make their demands for social change. In a recent survey 80% of the Nicaraguan population support the call for the government to resign immediately and avoid further conflict and bloodshed. Amnesty International, in a recent report Instilling Terror: From Lethal Force to Persecution in Nicaragua, has documented serious and continuing human rights violations against the civilian population on the part of the Ortega-Murillo government. Many of us in Ireland who are in regular contact with Nicaraguan friends and community organisations can verify that they are living in terror, afraid to leave their homes, are in hiding, or have had to flee the country in fear of persecution. We are alarmed and heartbroken at the extent and cruelty of the repression and are seriously concerned for the safety of ordinary citizens who are determined to go about their daily lives in peace, defending their right to have a voice in the running of their own country. 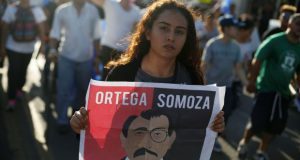 There is a long tradition in Ireland of solidarity with the Nicaraguan people since they collectively overthrew the dictatorship of Anastasio Somoza in 1979. In the 1980s over 150 Irish people went to Nicaragua as members of Solidarity Brigades to support the Sandinista Revolution in the face of the US-sponsored Contra forces. Since April, however, we have witnessed how many of the people we worked with and supported have become victims of government repression. Once a leader of the Sandinista revolution, Daniel Ortega and Rosario Murillo have amassed massive personal wealth, have concentrated control over media networks, energy companies and land in the hands of family members. Under their rule, corruption has become widespread and civil society has been dismantled. The judicial system up to the Supreme Court have been filled with Ortega loyalists who rubber-stamp his decisions. The police have been militarised. The electoral commission has been packed with Ortega loyalists who have engineered electoral frauds. He has eschewed international principles of human rights and social justice in his campaign to hold on to power. Given the history of US intervention in Nicaragua, we oppose any form of interference by the US government. We demand total respect for the Nicaraguan people’s right to self-determination. We cannot stand idly by. We want the Irish government to send a clear message that it cannot support state repression and terror against unarmed civilians. The Irish government has called on the government of Nicaragua to act on the findings and recommendations by the IACHR (Inter-American Commission on Human Rights) and OHCHR (Office of the UN High Commissioner for Human Rights), to ensure full accountability for perpetrators of human rights abuses and the disarming and disbanding of armed groups. The Minister for Foreign Affairs reiterated on the 21st of November the government’s demand that the government of Nicaragua stop the disproportionate use of force against demonstrators, halt arrests based on laws which criminalise peaceful protest, allow free peaceful demonstrators and re-establish the full respect of due process for all detainees. We call on the Minister for Foreign Affairs, as well as human rights, civil society, and development institutions, to continue to stand behind the calls for an immediate end to violent repression by police and paramilitary forces in Nicaragua and to arbitrary detentions and torture of protesters, and the release of all political prisoners; for the organisation of free and fair elections, under strict national and international observation, and finally, justice for the victims: the investigation, prosecution, and punishment of those responsible for all the acts of violence committed during the protests. We also call on the Irish government to work with international and European networks and institutions calling for an end to repression of civil society in Nicaragua.